The plant has naturalized in Oregon and California (The Biology of Australian Weeds 63. Thinopyrum junceiforme (Á. Löve & D. Löve) Á. Löve). Naturalized in Nova Scotia (GRIN). Hanlon, L.M.., & Mesgaran M.B.. (2014). The Biology of Australian Weeds 63. Thinopyrum junceiforme (Á. Löve & D. Löve) Á. Löve. Plant Protection Quarterly. 29(4), 120-126. Naturalized in CA and OR (The Biology of Australian Weeds 63. Thinopyrum junceiforme (Á. Löve & D. Löve) Á. Löve) which clearly overlap with CA (Cal-IPC). Environmental weed in Victoria (Invasive.org Center for Invasive Species and Ecosystem Health). A transformer species in Australia (Gaining new ground: Thinopyrum junceiforme, a model of success along the South Eastern Australian coastline). Sea wheatgrass is one of the dominant exotic species on the coast displacing native vegetation. However, many coastal managers, including state government coordinators, are unaware of the existence of sea wheatgrass, let alone its potentially adverse impacts, which may explain the lack of specific legislation related to this species (The Biology of Australian Weeds 63. Thinopyrum junceiforme (Á. Löve & D. Löve) Á. Löve). The University of Georgia - Warnell School of Forestry and Natural Resources and College of Agricultural and Environmental Sciences - Dept. of Entomology (2014). Invasive.org Center for Invasive Species and Ecosystem Health. James, K. Faye (2012). Gaining new ground: Thinopyrum junceiforme, a model of success along the South Eastern Australian coastline. Environmental weed in Victoria (Invasive.org Center for Invasive Species and Ecosystem Health). A transformer species in Australia (Gaining new ground: Thinopyrum junceiforme, a model of success along the South Eastern Australian coastline). Sea wheatgrass is one of the dominant exotic species on the coast displacing native vegetation. However, many coastal managers, including state government co-ordinators, are unaware of the existence of sea wheatgrass, let alone its potentially adverse impacts, which may explain the lack of specific legislation related to this species (The Biology of Australian Weeds 63. Thinopyrum junceiforme (Á. Löve & D. Löve) Á. Löve). Clear overlap with California climate zones (Cal-IPC). E. caput-medusae and E. repens are both weeds in California (CDFA; Cal-IPC). Council, C. Invasive P. (0). California Invasive Plant Council. Elymus farctus is a perennial grass, dominating the Mediterranean coastal sands of Egypt. E. farctus is a perennial grass of widespread occurrence in the psammophere; recorded in the coasts of northern Europe and the British isles, extending through Russia and Asia to Northern America (Nutrients alleviate the deleterious effect of salinity on germination and early seedling growth of the psammophytic grass Elymus farctus). Located primarily in Mediterranean regions and southwestern Australia (GBIF). Clear overlap with California climate zones (Cal-IPC). El-Katony, T. Mohamed, Khedr A-H. Abdel- Fatt, & Soliman N. Gadallah (2015). Nutrients alleviate the deleterious effect of salinity on germination and early seedling growth of the psammophytic grass Elymus farctus. Botany. 93, 559–571. In Britain, sea wheatgrass is regarded as a primary dune colonizer, where it develops dense swards on pre-established foredunes. Both native and exotic plants grow in association with sea wheatgrass on incipient dunes and foredunes in Victoria. On the incipient dunes, such plants may include native hairy spinifex, and the exotics Cakile spp. (sea rockets) and Euphorbia paralias L. (sea spurge). On the foredunes, the vegetation is more varied and includes the native plants Atriplex cinerea Poiret X A. paludosa (coast saltbush), and Ficinia nodosa (Rottb.) Goetgh., Muasya & D.A. Simpson (knobby club rush), with Lepidosperma gladiatum Labill. (coast sword-sedge) growing in the swale in the lee of incipient dunes. On open sites on the foredunes, hardy succulents such as native and naturalized Carpobrotus spp. (pigface), and native plants Rhagodia baccata (Labill.) Moq. (seaberry saltbush) and Tetragonia tetragonioides (Pall.) Kuntze (sea spinach), manage the inhospitable environment remarkably well, as does the native Geranium solanderi var. solanderi Carolin (native geranium). Exotic weed species such as Fumaria spp. (fumitory), Oxalis spp. (soursob) and Allium triquetrum L. (angled onion) are just a few of the smaller flowering plants, also found in association with sea wheatgrass on the foredunes. Hilton et al. (2006) proposed that the sand-binding ability of sea wheatgrass makes it more resilient to erosive processes in comparison to native flora. Indeed, sea wheatgrass is one of four exotic species that were noted by Heyligers (1985) as being more efficient than native species at trapping sand and building dunes where otherwise dunes would not have formed. Such dunes have the potential to limit sediment movement, thereby changing the ecosystems and geomorphology of the coastlines on which they appear. Thus it is of concern that sea wheatgrass can rapidly colonize the swash and incipient dunes after propagules are washed ashore following storms. One example where sea wheatgrass has spread with great rapidity is along the Younghusband Peninsula in South Australia, where James (2012) reports that the plant has spread at approximately 18 ha per year, outcompeting native species and altering ecosystems (The Biology of Australian Weeds 63. Thinopyrum junceiforme (Á. Löve & D. Löve) Á. Löve). Native foredune species may be displaced by this species, with its dramatic spread. Develops monocultures in many areas, displacing others as the primary pioneer coloniser species, and may spread at a rate of 18+ hectares per year (Gaining new ground: Thinopyrum junceiforme, a model of success along the South Eastern Australian coastline). An exhaustive Google/Google Scholar search did not reveal any additional evidence to support this and the question defaults to a “no” answer at this time. Eaten by rabbits (Strandline colonization by Elymus farctus in relation to sand mobility and rabbit grazing). In Victoria, anecdotal evidence suggests that sea wheatgrass is impacting upon the rookery of Eudyptula minor J.R. Forster (fairy penguin) on Phillip Island’s Summerlands beach, by creating steep-fronted incipient dunes that are too high for the birds to climb in order to access their burrows. Furthermore, on Phillip Island and beaches in Victoria such as those on the Barwon Coast and Geelong, the endangered Thinornis rubricollis Gmelin (hooded plover), which prefers a nest scrape with little vegetation on which to lay its eggs, is likely to have its nesting sites encroached upon by sea wheatgrass. Steep-fronted incipient dunes that are thickly vegetated with sea wheatgrass are also found along the South Australian coast, such as at Normanville (The Biology of Australian Weeds 63. Thinopyrum junceiforme (Á. Löve & D. Löve) Á. Löve). Sea-wheat grass has a similar effect to marram grass and sea spurge, in that it stabilises beaches and detrimentally effects the nesting habitats of many shore birds (Tasmanian Government Invasive Species). An exhaustive Google/Google Scholar search did not reveal any additional evidence to support this and the question defaults to a “no” answer at this time. However, there are potential indirect impacts on the health and viability of some wildlife populations. Harris, D.., & Davy A.. J. (1986). Strandline colonization by Elymus farctus in relation to sand mobility and rabbit grazing. The Journal of Ecology. 1045–1056. Department of Primary Industries, Parks, Water and Environment (2014). Tasmanian Government Invasive Species. The plant is a perennial rhizomatous herb with erect, rigid 40-50 cm long stems, flat ribbed 0.5 cm wide silver-colored stiff leaves and 5-10 cm long spike. The plant flowers and sets seeds from May to July (Nutrients alleviate the deleterious effect of salinity on germination and early seedling growth of the psammophytic grass Elymus farctus). Unlikely given size and growth habit - an exhaustive Google/Google Scholar search did not reveal any additional evidence to support this and the question defaults to a “no” answer at this time. The plant is a perennial rhizomatous herb. The plant propagates by seeds and also vegetatively by rhizomes (Nutrients alleviate the deleterious effect of salinity on germination and early seedling growth of the psammophytic grass Elymus farctus). Spread horizontally by rhizomes (Gaining new ground: Thinopyrum junceiforme, a model of success along the South Eastern Australian coastline). Multi-node fragments had a greater probability of emergence than single-node ones at any depth, and also could emerge from greater depths. n contrast to seeds, the rhizome buds of E. farctus are not primarily dispersive structures, although once removed from the parent plant by breakage or decay of rhizomes they can produce shoots and adventitious roots. Both seeds and rhizome fragments have been found to play quantitatively similar roles in recolonization of the strandline. (Regenerative potential of Elymus farctus from rhizome fragments and seed). Recolonization by Elymus farctus was rapid after complete removal of the strandline by a catastrophic storm. Seeds (caryopses) and rhizome fragments were of very similar importance as propagules in founding new clumps; seeds and rhizome fragments also contributed similarly to the overall tiller densities found in a colonizing population. In some cases, recolonization must be by the arrival of seeds and rhizome fragments from the foredune (Strandline colonization by Elymus farctus in relation to sand mobility and rabbit grazing). Plants are fragmented during periods of erosion and fragments and seeds are transported to the sea and thus new areas by wind or waves (Gaining new ground: Thinopyrum junceiforme, a model of success along the South Eastern Australian coastline). Harris, D.., & Davy A.. J. (1986). 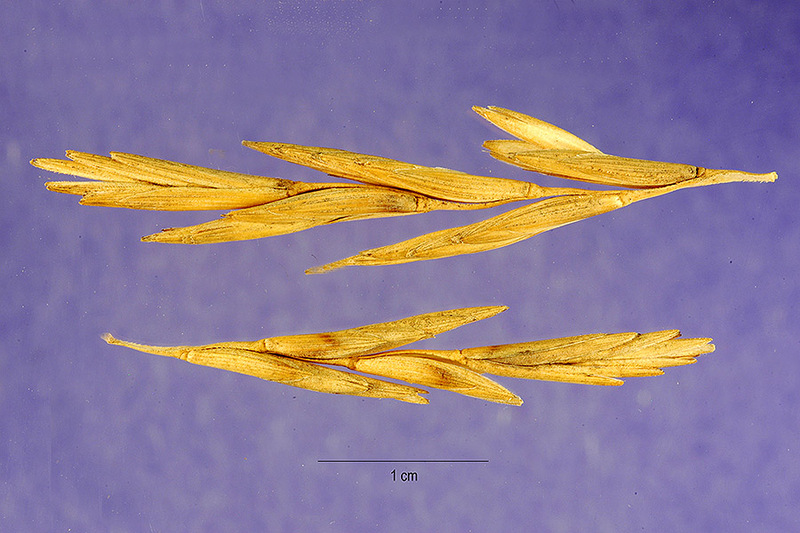 Regenerative potential of Elymus farctus from rhizome fragments and seed. The Journal of Ecology. 1057–1067. The plant flowers and sets seeds from May to July. The plant propagates by seeds and also vegetatively by rhizomes (Nutrients alleviate the deleterious effect of salinity on germination and early seedling growth of the psammophytic grass Elymus farctus). It has been argued that in their natural habitat, Elymus farctus (Thinopyrum junceiforme) tillers need vernalization in order to flower. Field observations from research in Australia note that the production of inflorescences is limited, and this may be because Australian coastal winter temperatures are not as low as those in Britain. Sea wheatgrass can reproduce both sexually and asexually, but production of flowering tillers in Britain (Harris and Davy 1986a) and mature seeds in Australia is low (The Biology of Australian Weeds 63. Thinopyrum junceiforme (Á. Löve & D. Löve) Á. Löve). The plant is not a prolific seeder and many spikelets do not produce seed (Gaining new ground: Thinopyrum junceiforme, a model of success along the South Eastern Australian coastline). While quantitative estimates were not found, seed production is uniformly classified as low or non-existent, with primary spread by vegetative means. The preliminary germination test returned a fairly high germinability of 84%. The fairly high germinability of E. farctus seeds points to readiness of seeds of this grass to germinate. Wild species usually exhibit seed dormancy of diverse causes and this represents an efficient strategy to spread germination over time and to avoid occasional germination in unappropriate environments. Presence of nutrients in the germination medium seems to alleviate the deleterious effect of salinity on germination and early seedling growth of E. farctus. Nevertheless, the comparable values of germinability and most of the germination speed indices as well as seedling growth in the presence and absence of nutrients at zero salinity suggests that the presence of nutrients is not essential for seed germination and seedling growth in non-salinized habitats (Nutrients alleviate the deleterious effect of salinity on germination and early seedling growth of the psammophytic grass Elymus farctus). In Britain, sea wheatgrass requires vernalization in order to flower; however flowering usually occurs in the second year of growth, and flowering was limited due to the proximity of plants to wave disturbance along the swash, as well as grazing by rabbits (The Biology of Australian Weeds 63. Thinopyrum junceiforme (Á. Löve & D. Löve) Á. Löve). Plants derived from rhizomes may flower in their first year, while those derived from seed may not flower until their second or third season (Gaining new ground: Thinopyrum junceiforme, a model of success along the South Eastern Australian coastline). The plant flowers and sets seeds from May to July (Nutrients alleviate the deleterious effect of salinity on germination and early seedling growth of the psammophytic grass Elymus farctus). Flowers Nov-Dec in California (Cal-IPC). It is hypothesized that as the winters in Australia are not as cold as those in Europe, flowering is limited, appearing in December, January, and occasionally in February, although the flowers do not persist for long on the stems (The Biology of Australian Weeds 63. Thinopyrum junceiforme (Á. Löve & D. Löve) Á. Löve). Dispersed externally on animals (Invasive.org Center for Invasive Species and Ecosystem Health). However, an exhaustive Google/Google Scholar search did not reveal any additional evidence to support this as a frequent mechanism of dispersal, there are no morphological adaptations for attachment, and the primary method of long-distance dispersal appears to be water, so the question defaults to a “no” answer at this time. Effective dispersal along the strandline depended on the growth of rhizomes into the high risk area where they were fragmented and dispersed by storm waves (Strandline colonization by Elymus farctus in relation to sand mobility and rabbit grazing). Spread by wind and water (Cal-IPC). Hydrochory, or the passive dispersal of propagules by water, is the most likely vector for the dispersal of sea wheatgrass caryopses along the coastline of southern Australia (The Biology of Australian Weeds 63. Thinopyrum junceiforme (Á. Löve & D. Löve) Á. Löve). Plants are fragmented during periods of erosion and fragments and seeds are transported to the sea and thus new areas by wind or waves. Seeds can float for three weeks and delay germination until removed from salt water (Gaining new ground: Thinopyrum junceiforme, a model of success along the South Eastern Australian coastline). Propagules are transported in sand replenishment along metropolitan coasts in Australia (Gaining new ground: Thinopyrum junceiforme, a model of success along the South Eastern Australian coastline).